Michigan apples are available nearly 365 days a year, which means there’s often an opportunity to bite into a juicy McIntosh, sweet Golden Delicious, the popular and full-flavored Red Delicious, or any of the 13 other locally grown apple breeds. As tasty as the selection created by the more than 11.3 million apple trees in commercial production in the state can be, adding a candy coating can make them even more enjoyable. “I believe caramel and candy apples are comfort food,” says Renee Bow’les, confectioner and owner of Eastern Market-based Chewy’s Gourmet Kitchen, which specializes in candy apple creations. 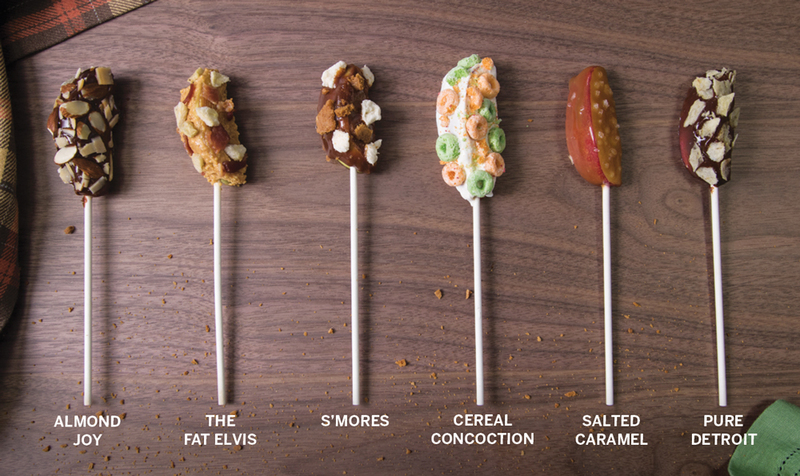 From Sanders chocolate or caramel dip, vanilla-infused marshmallows from Detroit Marshmallow Co., crunchy Better Made Chips, Dearborn bacon, and more, local ingredients can help add interest to your candy apples. But, be warned, making them look pretty is no easy feat. After washing, dry apples well. Remove stem and cut into 1-inch slices. Carefully push lollipop sticks into each slice and set aside. *If preparing apples for a party ahead of time, toss slices in fresh lemon juice to avoid browning. Place caramel or chocolate into a double boiler over medium heat. Melt until smooth. Or, place caramel or chocolate in a microwave safe bowl. Heat in 20 seconds intervals, stirring between. Heat until smooth. Allow the caramel or chocolate to cool until it is warm and thick. This will prevent your topping from slipping off the apple. Dab apple slices with a paper towel to remove any moisture. Dip apples carefully in a rolling motion. Use a spoon or butter knife to apple more topping as you rotate the stick. Once fully coated, rest on a baking sheet covered in wax paper. Sprinkle desired toppings over each apple. (See above for inspiration.) Avoid dipping, as this can leave excess chocolate or caramel behind.